Can the NPA's credibility be rebuilt? Once again, South Africa has a new head of prosecutions. Adv Shaun Abrahams will be the sixth head of the National Prosecuting Authority (NPA) in 10 years. Appointed by President Jacob Zuma last week, Abrahams is at the helm of arguably the most important department in the criminal justice system. But he takes over an organisation whose leaders are better known for allegations of political bias, abuse of power and misconduct, than the integrity and independence the position requires. Heading the NPA is clearly no easy task. Most of Abrahams’ predecessors faced massive political pressure and interference resulting in early and controversial departures – the position is supposed to be held for 10 years. Zuma’s presidency has, in many ways, been devastating for the NPA. To ensure his appointment as president, the 783 criminal charges of corruption, fraud, racketeering and money laundering facing Zuma had to be dealt with. Indeed, these were hastily and controversially withdrawn by then acting National Director of Public Prosecutions (NDPP), Mokotedi Mpshe. The official opposition party, the Democratic Alliance (DA), is challenging the decision to withdraw the charges, a matter that remains before the courts to this day. Zuma then appointed Menzi Simelane who, after only a few years, was forced to vacate the position. This after the Supreme Court of Appeal found that he was not suitable for the job, given his lack of integrity before the Parliamentary Commission of Inquiry – the same commission that cleared former NDPP head, Vusi Pikoli, of any wrongdoing. Following Simelane, Zuma appointed Nomgcobo Jiba as the acting NDPP, a position she held for 18 months. Her appointment was controversial; as she had formerly been suspended from the NDPP for her role in the illegal arrest of prosecutor Gerrie Nel, who was prosecuting former police chief Jackie Selebi at the time. She allegedly continued to abuse her powers while acting as NDPP, and is currently facing criminal charges and disbarment related to perjury and alleged misconduct before various courts. During Jiba’s tenure in 2013, the Council for the Advancement of the Constitution then took Zuma to court to force him to appoint a permanent head. This action was taken because acting NDPPs can be removed at any time, compromising their independence. As a result, Zuma appointed Mxolisi Nxasana as the NDPP, but a year later announced that Nxasana’s fitness for the position would be the subject of a board of inquiry. Apparently this had to do with several criminal investigations and charges against him that weren’t properly disclosed during his security vetting process. However, just as he was prepared to face a board of inquiry over these allegations, Nxasana was paid out the value of the remainder of his 10-year contract – around R17,3 million. Abrahams’ appointment comes hot on the heels of these controversies and he inherits, what some have dubbed, ‘the poisoned chalice of the NPA’. The response to Abrahams’ appointment has been mixed, and understandably so, given the turbulent history of previous incumbents. The DA quickly raised their concern that Abrahams is relatively junior and ill-qualified, and that the position should have gone to someone with more experience – like former acting national director of prosecutions Silas Ramaite or Willie Hofmeyer. The DA is also concerned about his ‘proximity’ to Jiba, although they don’t make any specific allegations in this regard. However, unlike all his predecessors – going as far back as the first prosecutions head, Bulelani Ngcuka – Abrahams is a career prosecutor with managerial experience. Before his appointment, he had been acting head of one of the NPA’s specialised units, the Priority Crimes Litigation Unit. With over 17 years experience, Abrahams is best known for his successful prosecution of Henry Okah, the former leader of the Nigerian terrorist group, Movement for the Emancipation Delta. 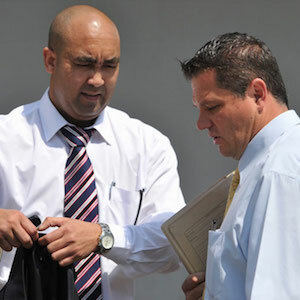 Abrahams also led the prosecution against the infamous ‘Mangaung 4’, who plotted to blow up the African National Congress elective conference venue in December 2012. Abrahams is experienced and committed to upholding the rule of law in Africa and globally, according to Anton du Plessis, former prosecutor and current managing director of the ISS. Abrahams has worked tirelessly to build prosecutors’ capacity to deal effectively with organised crime, terrorism and international crimes like genocide and war crimes. He also recently helped develop Africa’s first counter-terrorism manual for the Africa Prosecutors Association. ‘In our experience working with Abrahams on various projects to strengthen the prosecution service, not only here in South Africa, but elsewhere on the continent, he demonstrated an unparalleled commitment to justice,’ says du Plessis. While Abrahams is undoubtedly a skilled prosecutor, he faces a daunting task. Political interference at the highest levels of the NPA has undermined public trust in the organisation and negatively affected its performance. While the number of arrests made by the police has increased by 56% over the past decade, the total number of cases concluded by the NPA has declined by 14%. This is not solely the NPA’s fault; it is also a consequence of the deterioration of the detective services. But problematic leadership has certainly undermined the organisation’s ability to do the basics. The independence, integrity and expertise of the person appointed as NDPP is crucial for the effectiveness of the NPA and the rule of law more generally. To ensure that the head of the NPA possesses these qualities and is best suited for the job, the ISS has, in the past, called on the president to adopt a transparent and competitive recruitment process run by a qualified and independent selection panel. South Africa is fortunate to have many highly experienced prosecutors who should have an opportunity to apply for the post of NDPP. As an experienced and accomplished prosecutor, Abrahams may be just what the NPA and rule of law in South Africa now need. Given his experience in the organisation, Abrahams has insight into the demands of the difficult top job. The challenge for him will be to rebuild and strengthen the NPA at a time when public confidence in the prosecution service and criminal justice is low. Whether the new prosecutions head can withstand the enormous political pressure that he will no doubt face remains to be seen. South Africans are reeling from the government’s latest rejection of its own court decisions and laws, after Sudanese President Omar al-Bashir was allowed to leave the country last week despite a high court order forbidding it. Coming on the back of the continuing lack of accountability by government, and the president, in relation to the Nkandla scandal, public scrutiny of Abrahams will be high.